Just about anybody who has got a transaction or business to do online. Ghana is set to be PayPal compliant by 2020. I’m very careful in throwing specific dates around. Not because I don’t trust my Vice President. But politician are fond of doing magic. Anyways, compliant or non-compliant, life must go on. You and I will continue pursuing an equal, risk-free and better online presence for ourselves and Ghana. In fact, we have no choice. So what’s the state of PayPal in Ghana this 2019? Notwithstanding, more people are getting on board. More questions are being asked. More breakthroughs. And the barrier to entry is getting lower by the day. Is a good thing, isn’t? PayPal Ghana 2019 is real and you’ll love it. Use the links or button below to sign up for FREE TRAINING and tutorials on “How to Use Online Tools to Earn Real Money on the Internet” through internet and digital marketing. Type PayPal.com into your browser to visit PayPal’s website and click Sign Up at the top of the page. Select the type of account you want to open, either “Personal” or “Business” and click Continue. You hit the Sign Up now button on the PayPal website and you’re good to go. Your PayPal Ghana account is ready. I’ve taken money from people to help them create this account before. And I’ve never felt good about that. I’m not holier than thou. But my principles and conscience kind of strike me always. PayPal is a free service. Just that – its not in Ghana. But you’re rendering a valuable service? And I also know what giving FREE valuable content consistently to a target audience can do to my brand and my business. Especially, from a marketing point of view. And so, I’ve created several videos on “How to create a PayPal account for free in Ghana”. I’ve spent 1000’s of cedis on tools and resources to help people in this regard. There’s no exception this year. I am walking you through PayPal Ghana 2019 and will continue until you’re satisfied. I don’t know – are just lazy and can only get lazier. After all these investments to help you create a PayPal account for free, some people still beg me to take their moneys and do it for them. You do it – I’ll guide you for free. And they say no – do it for me. I know there are some very busy folks who may need PayPal accounts for their business quickly. And some other people who prefer to outsource anything tech related rather than get their hands dirty. Talk about all the frustrations and details. And so I started putting a premium value on this gig. 100 cedis, 200 cedis and these same people complain. I’ve spent several 1000’s of cedis to create free videos, blog post and even a course on PayPal in Ghana – pay 150 cedis for a ‘Done For You” account and you’re complaining. Until you take risk and invest your own money into things that can help you grow and earn real money – you probably need to write another job application. 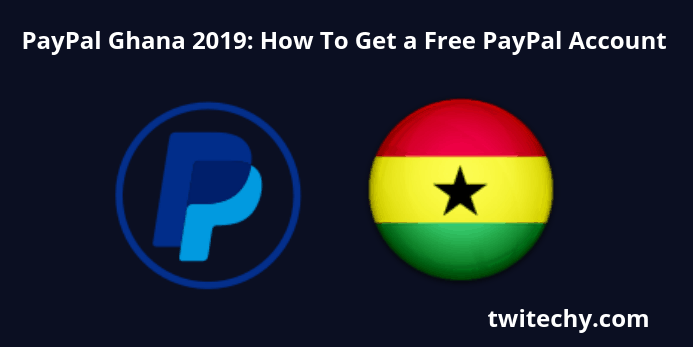 Here is the video tutorials that will make all the difference in your quest to create your first PayPal Ghana 2019 account today. Follow every step on the way and also have a look at the full course in the training area. I dive deeper with the advanced course. I will put a ‘link button’ down to the advance course with about 11 powerful video. Nobody jokes when it comes to withdrawing money from any financial entity. Money is blood. However, upon my research on various PayPal forum threads on their website, this is what i found. It’s quite simple to withdraw money from your PayPal account. There are several ways to withdraw money from your PayPal account. You can either transfer money directly to your linked bank account, use your PayPal Debit MasterCard®, or have PayPal mail you a check. However, things are quite different for Ghanaian users. Since PayPal is not officially in Ghana, withdrawing cash has never been easy. PayPal as it is has several advantages over other payment processors and providers. Apart from it’s dominance and popularity, it is quite easier and flexible in relation to its core duties – payments and withdrawals. PayPal is not only a problem to the myriad of Ghanaians hoping to use the platform without any restrictions but it is also widely criticized for it’s notorious treatment of some users. Therefore, the question of alternatives come to mind. There can be several simple and quite complicated alternatives to PayPal in Ghana. Payoneer in Ghana is a simple cross-border payments platform that empowers businesses, online sellers and freelancers to pay and get paid globally as easily as they do locally. This payment platform is a New York based fund transfer service. With over 13 years of experience you’re assured of its legitimacy. I’ll have to talk about Xoom here once again. Yes I should. Xoom is a service affiliated to PayPal. PayPal’s own money transfer service. Here, you can send, request and receive moneys to and from your PayPal account. One could easily realize that PayPal bought this new money transfer service to help with the growing issues with transfers abroad – by its users. This Xoom service can be used or accessed through your PayPal account. You can also subscribe to it as a standalone service. However, as I’ve already mentioned – you cannot send money from your PayPal balance. Transfer from PayPal could only be done through your linked debit/prepaid or credit card. PayPal in Ghana like anywhere else allows you to send and receive money from almost anyone and anywhere with a few simple clicks. And Xoom is the money transfer option for users who wants to send money abroad through PayPal. Don’t worry if it sounds complicated. This video may come to your rescue. Stripe is an online payments system that offers payment transfer capabilities along with credit card processing and other features for internet commerce. Expect a full tutorial on “How to create a Stripe account in Ghana” in the near future. Stay with me on this blog for more on this. How long have you been struggling with PayPal in Ghana? Do you have a PayPal Ghana account already? Your comments and feedback is my fuel – let it flow.